The holy month of Ramadan is about to begin. It is a time of the year when Muslims all over the world fast from sunrise till sunset and devote their time in prayer. Elaborate and special meals are usually prepared for iftar i.e. at the time of breaking the fast. Today in this post i am sharing some delicious recipes that you can prepare for iftar. 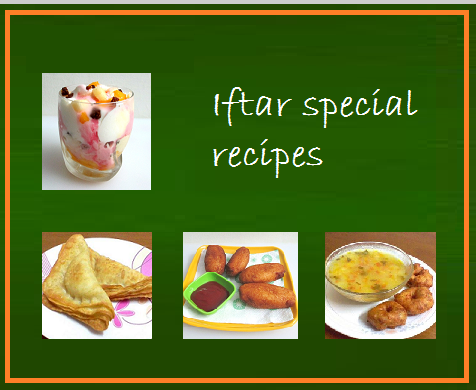 You can also check out my next post on more iftar special recipes by checking out iftar special recipes part 2. Milkshakes are a great way to break the fast. This milkshake is filled with the goodness of apples and cashews. Strawberries are known for their wonderful flavour and taste.This is a simple recipe of milkshake made using fresh, juicy, and red strawberries. This recipe makes approximately 2 glasses of strawberry milkshake. Mangoes are one of the most cultivated fruits in the world. They are the king of fruits and recipe makes you like mangoes more than ever before. 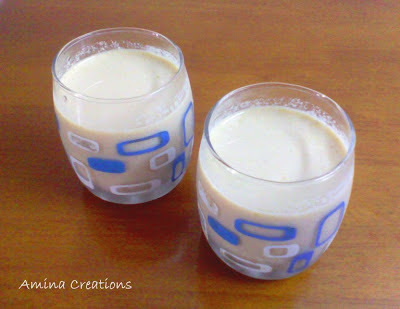 Badam hareera is a healthy and delicious drink made using milk and almonds. It is commonly prepared for iftars during the month of Ramadhan and served hot. This is a refreshing ice cream recipe filled with fruits, dried fruits and nuts. Nonbu ganji is a nutritious rice and meat dish having porridge like consistency. It is very popular in South India and is often served at iftars during Ramadan with Ulundu vadai/ Urad dal fritters. The combination of vadai and ganji tastes delicious. The crispy vadai is usually dipped in hot Nonbu ganji and taken. Another iftar special is a delicious meat based dish called Haleem. It is high in calories and fibre and gives instant energy to the body. The preparation of haleem generally takes several hours together where meat is cooked along with rice, dal (lentils) and spices till all the ingredients combine well and have a thick consistency.I am sharing with you my mother's Haleem recipe which can be cooked in less time as it uses a pressure cooker and tastes delicious. Kheema samosa or minced meat samosa is a very delicious type of samosa commonly prepared in the North Arcot district of Tamil Nadu. Here there are several layers of dough on top of each other and the samosa is usually stuffed with minced meat (kheema) filling. As a result these samosas are crunchy on the exterior and spicy and soft in the interior.These delicious Kheema samosas are a must have during festivals and parties and no Ramadan iftar party is complete without this. 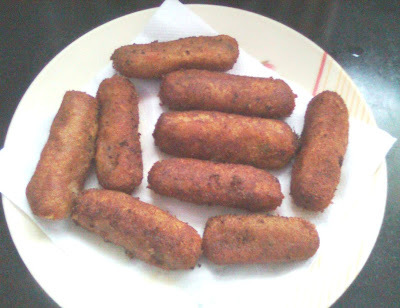 Ulundu or Medu vadai is a popular south indian delicacy. This delicious vadai is served during iftars with nonbu ganji. Another iftar special recipe made using boiled eggs. This recipe makes 8 egg bajjis. Delicious samosa recipe with egg filling. Makes 20 to 25 samosas. You can adjust the quantity of ingredients according to your requirements. Seekh kabab is one of the most popular varieties of kabab. Traditionally it is cooked in a charcoal oven which gives a wonderful texture and flavour to the kababs. But it can also be made easily at home by frying them in oil without any compromise on taste. This is a traditional recipe from my mother. It is very easy to make, takes just about 30 minutes and uses minimal quantity of oil. This is a delicious recipe made using dals. These vadais are easy to make and does not consume much time. Bread rolls can be prepared in several different ways. They can be stuffed with vegetable or meat filling and stir fried or deep fried in oil. In this recipe the rolls have vegetable stuffing and have been deep fried in oil. You can serve these hot bread rolls with tomato ketchup or green chutney. Potato samosa are very popular in India. I am sharing the recipe of the potato samosa we make at home. The outer part is crunchy while the inner potato mixture just melts in the mouth. Raw banana or plantain is commonly used in Indian cooking much like the potatoes. It is versatile and can be used to cook curries, stir fries, snacks, etc. Raw banana fritters or Vazhakka bajji is a very popular snack in Tamil Nadu and is also prepared for iftar. Cutlets are a great favourite of mine and my mother’s cutlets are simply yummy. They are very easy to make and can be made a day earlier, refrigerated and fried the next day. It is a good option especially when you have guests coming to your home for iftar. This recipe makes approximately 25 cutlets. This is a very simple and easy to cook recipe. The rolls are crispy on the outside, soft inside and the cheese just melts in the mouth. This gets done in about 20 minutes. Biryani is an exotic dish made using a variety of spices, meat and rice. No doubt it is one of the most sought after dishes in India and festivals, special occasions and feasts are incomplete without it. This is my mother's chicken biryani recipe which is simply delicious. This is an easy to cook recipe and can be cooked in about half an hour. Here we have used a pressure cooker to create 'dum' for the biryani. This ensures that flavour and aroma are intact and the biryani comes out perfect. Hyderabadi Biryani is by far the most popular variety of Biryani. Even this Biryani tastes slightly different in different places due to its preparation method and the secret ingredient used, but there is no denying the fact that its taste is simply wonderful. This recipe of Hyderabadi biryani has been adapted from Sanjeev Kapoor's Hyderabadi biryani recipe. It requires a lot of work, patience, precision and most importantly time to make this mouth watering delicacy at home. But it is worth the effort. Think about Chinese food and the first thing that comes to our mind is fried rice. Vegetable fried rice tastes best when served with Kung pao chicken or Cauliflower manchurian. Bread upma is a flavourful and delicious dish made using bread. It can be prepared for iftar if you want a change from the regular iftar meal. We usually add only potatoes in this recipe, but you can add peas, carrots or any other vegetable of your choice. This is the one of the most tastiest recipes from my mother’s kitchen. It is simply yummy and is a must have at the iftar table. This recipe gives a delicious twist to the regular Maggi noodles. The addition of tomatoes, onions and masalas add a wonderful taste to the noodles. This is my Mom in laws recipe and is a great hit at home. This is yet another delicious traditional recipe from my mother’s kitchen. This is easy to make and tastes delicious. This is a very simple and easy to cook noodle recipe tha gets done in less than 20 minute. I have used carrots, beans and capsicums but you can use any vegetable of your choice. Kheema paratha or ceylon paratha is a delicious and popular paratha. Here whole wheat rotis and spicy minced meat (kheema) filling is prepared and the kheema is placed between two rotis and sealed with egg mixture. You can prepare the kheema in advance and use it to make the parathas. These parathas serve as a filling meal for either seher or iftar. Delicious parathas made using potatoes and spices. Easy to cook pasta recipe that requires very few ingredients and gets cooked in about 20 minutes. Another delicious iftar special recipe where roti is filled with kheema and sealed with egg mix. Vegetarians can replace the kheema filling with potato mixture and egg with maida + water mix.